I’m incredibly excited that today we announced NGINX has signed a definitive agreement to be acquired by F5. While there will be a lot of press and formal announcements explaining the reasoning behind the decision, I wanted to share a few words of my own. We’ve built an incredible company, which led to today’s event. As I reflect on how we achieved this success, I landed on three key themes: technology, family, and vision. At the core of NGINX’s success is the amazing technology that Igor Sysoev wrote back in 2002. His decision to open source this technology literally changed the world. You may not see it that way, but the honest truth is that over my six years at the company, almost every user has told me that they couldn’t have built their applications if it wasn’t for NGINX. We wouldn’t have experienced amazing digital experiences like Instagram, Pinterest, Netflix, Airbnb, and hundreds of thousands more apps if it wasn’t for Igor open sourcing NGINX back in 2004. Now there are over 374M sites using our software and nearly 67% of the highest‑traffic sites on the Internet. The reality is that whether you know it or not, you use NGINX every day of your life when you post a photo, watch streaming video, purchase goods online, or log into your applications at work. Around this core we built an incredibly talented and passionate family. It’s this family that transformed open source from a technology to a company, and from a company to a market leader. I joined this small family back in 2012 when there were just eight people. Now our family has grown to more than 250 people. Over the years we’ve had people join, leave, get engaged, get divorced, get married, have children (myself included), recover from life‑threatening accidents or illnesses, and, in some cases, lose loved ones. All things that typically happen to an extended family. We’ve lived through these moments together and every single one of these people contributed to our success. It underscores an ethos we live by: mutual accountability. Put simply, it means do your job well and care for each other. That served us incredibly well and I thank Jeff Immelt for sharing this ethos with us. Finally, the vision. Back in 2012 we didn’t have a commercial offering, only a few support contracts that provided very little revenue. The future was by no means certain. No one in history had built a successful commercial entity around a web server. Many have tried, none with success. One of the founders, Andrew Alexeev, and I spent most of 2013 talking to the largest users of NGINX to learn how they were using the technology, to find inspiration for a commercial offering. We got incredible input from companies like Airbnb, Dropbox, Box, Netflix, LivingSocial, Distil, Yammer, Eventbrite, and many more. I’m still humbled and thankful for those invaluable insights and contributions in the early days. 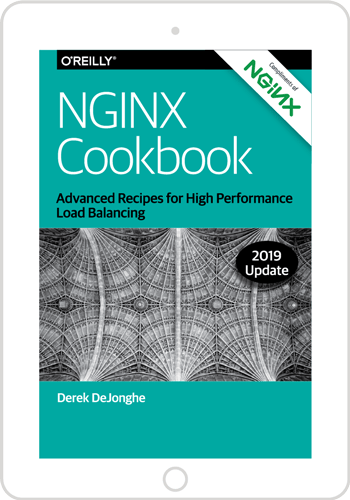 NGINX was an incredible frontend, an entry and exit point for all traffic flowing in and out of applications due to its high performance and concurrency. Behind this frontend was a distributed architecture made up of many services that communicated with each other using NGINX as a proxy for API traffic over HTTP. From this learning we created our vision for the company – Help customers build distributed, web‑scale applications. Later we would come to know this phenomenon as microservices. 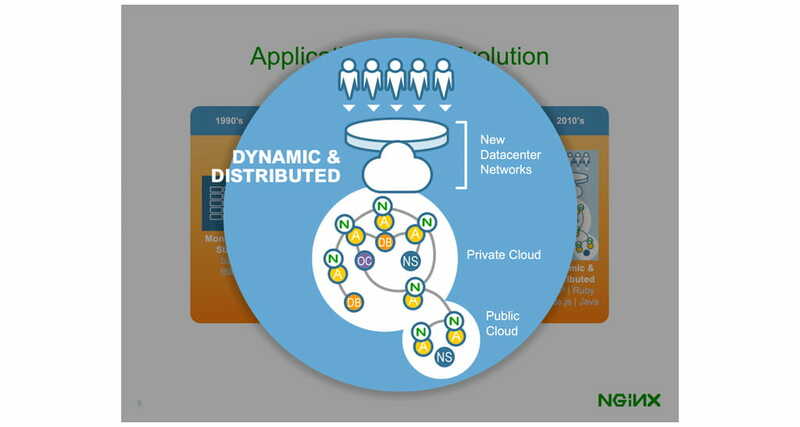 Below are two slides from our 2013 Series B pitch deck that show this vision for distributed applications working in hybrid environments between private and public clouds. 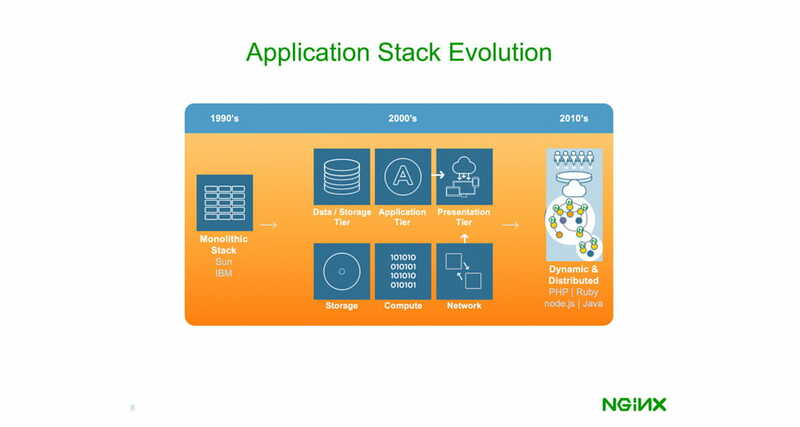 To orient you to the diagram below: “N” is an NGINX instance, “A” is an application, “OC” is an object cache, “DB” is database, and “NS” is a NoSQL database. This clearly shows that we believed that enterprises were going to move from service‑oriented architectures (SOA) to dynamic and distributed architectures. Not only was this microservices before the industry used that term, but it was the seed of what we now call a service mesh – a specific microservices infrastructure used in some of the most advanced environments in the world. To go after this vision and provide web‑scale capability to enterprises, we incubated a commercial solution in AWS in 2012 and went on to launch it as NGINX Plus in late August 2013. This product, built and supported by the engineering team led by our other founder, Maxim Konovalov, has driven over 90% of our revenue to this day. We now have thousands of customers and over 150 of the Global 2000 using NGINX Plus to deliver their applications. Incredible numbers achieved in less than six years. Although we never set out to build a company to be acquired, it’s one of the two possible outcomes for a startup, the other being an IPO. I believe F5 will be a great home for the technology, the open source project and community, and the family that have made NGINX successful. With today’s news, our vision and mission don’t change. We’re still helping customers build distributed application architectures. We’re still building a platform that optimizes ingress‑egress traffic and APIs. And we’re still helping companies on their journey to microservices. What does change is our trajectory. F5 shares our mission, vision, and values. But they bring to bear a tremendous amount of additional resources and complementary technologies. And make no mistake about it: F5 is committed to keeping the NGINX brand and open source technology alive. Without this commitment, the deal wouldn’t have happened for either side. Looking forward, what excites me is the potential of combining the leaders in their two respective markets. We have complementary strengths. F5 is the industry leader in application infrastructure for network and security teams. NGINX is the industry leader in application infrastructure for developer and DevOps teams, built on our open source core. Our web and application server, microservices, and API management solutions complement the application management, application security, and infrastructure security solutions from F5. Even in the case of application delivery controllers (ADC) where there is some overlap, NGINX has created a lightweight, software‑only version that complements the F5 cloud, virtual, and physical appliance options. I truly believe the combination opens up a larger addressable market and accelerates our collective growth. It’s a story where the sum is greater than the individual parts. Enterprises are undergoing digital transformation. Their applications are their business. Combined, F5 and NGINX provide a new, end-to-end set of application offerings that bridge the divide between NetOps and DevOps. The result? Customers can spend more time focused on their apps, and less time worrying about the underlying infrastructure. We’re truly excited to be joining the F5 family and looking forward to the journey ahead. If you have any concerns or questions, I’d like to hear them. Leave a comment below.